Cervical artificial disc relieves pain & helps retain neck mobility. 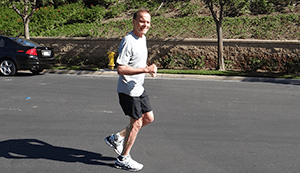 Bill was referred to an orthopedic surgeon by his primary care provider. The surgeon suggested Bill start with nonsurgical spine care and the use of cervical epidural injections to help free up the pinched nerve in his neck. Unfortunately, the injections didn’t help relieve Bill’s symptoms. The orthopedic surgeon next talked with Bill about spine surgery options including a cervical spine fusion. The surgeon also talked with Bill about an artificial disc surgery that could help relieve his symptoms and allow him to retain motion, but the surgeon was not trained in the procedure. Bill understood the importance of being informed about his healthcare options so he sought opinions from four spine surgeons, including two orthopedic surgeons and two neurological surgeons. The consensus was that he would need spine surgery to relieve his severe cervical spinal stenosis. “I understood that a cervical fusion would mean a loss of movement in my neck. With my active lifestyle, I was reluctant to have a fusion if there were other options available that would allow me to keep normal neck motion,” Bill explains. This desire compelled Bill to research cervical artificial disc options that would remove pressure on the nerve roots and still allow him to retain motion. Bill’s research for spine surgeons trained in artificial disc replacement led him to Dr. John Regan, the founder of Spine Group Beverly Hills and former Director of Spinal Disorders at Cedars- Sinai Institute. He made an appointment with Dr. Regan where the surgeon reviewed his medical history and diagnostics. Dr. Regan next talked in detail with Bill about his spine condition before they discussed treatment options, including the Mobi-C artificial disc. Dr. Regan cautioned Bill that the artificial disc is not appropriate for all patients. After going through the screening process Bill was relieved to learn that he was indeed a candidate for the artificial disc. He decided to have the artificial disc replacement surgery performed by Dr. Regan and the surgery was a success. Following his surgery, Bill no longer had the constant pain and tingling in his upper extremities. He was back at the office within a week and back to running within a month. Bill attended physical therapy after his surgery where he learned specialized exercises designed to help with recovery and strengthen his neck muscles to prevent future strain. Today, Bill is back to working out in the gym and running 7 miles a day — and most importantly — symptom-free. “Dr. Regan is a masterful surgeon, I have recommended him to others and will continue to do so,” Bill reflects.